Hail Recon® is the best mobile hail mapping experience available. Period. 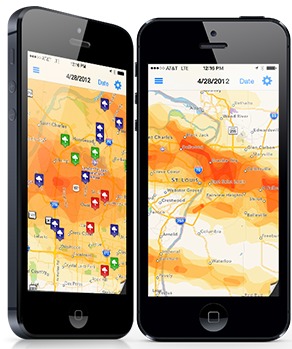 Hail Recon® is the iPhone, iPad, and Android companion app for Interactive Hail Maps that makes printed hail maps a thing of the past. With Hail Recon®, you get a blue dot on your screen that shows you where you are in relation to the hail path. 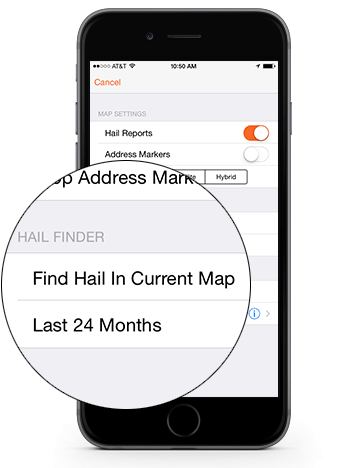 You can also drop markers on addresses or anywhere on the hail map to create hail history reports. Finding hail dates is a snap and you can even select houses to monitor for future hail storms! You will never know how you got along without it. Download Hail Recon® Today. Are you in the hail? No more looking up streets and trying to figure out when you are in the hail path. 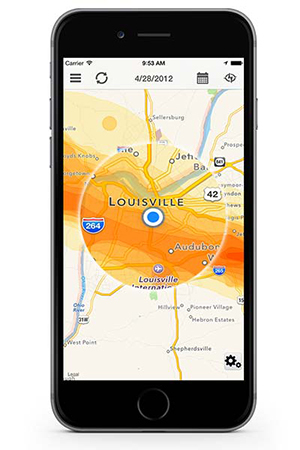 Hail Recon® makes it easy by showing you a blue dot that marks your exact location. Did you make 4 or 5 turns while scouting hail in an unfamiliar suburb or city? No problem. Just look at Hail Recon® to see both the hail swath and your location! Turn By Turn Directions to The Hail. With Hail Recon® you can tap on any marker to get turn-by-turn directions from your current location to that marker’s location. Now you can drop markers on the places you would like to scout for hail damage and easily find those locations with your phone’s GPS! All you need to do is open Hail Recon® and select a previously dropped marker or press your finger tip on the hail map for 1 second to drop a new marker. 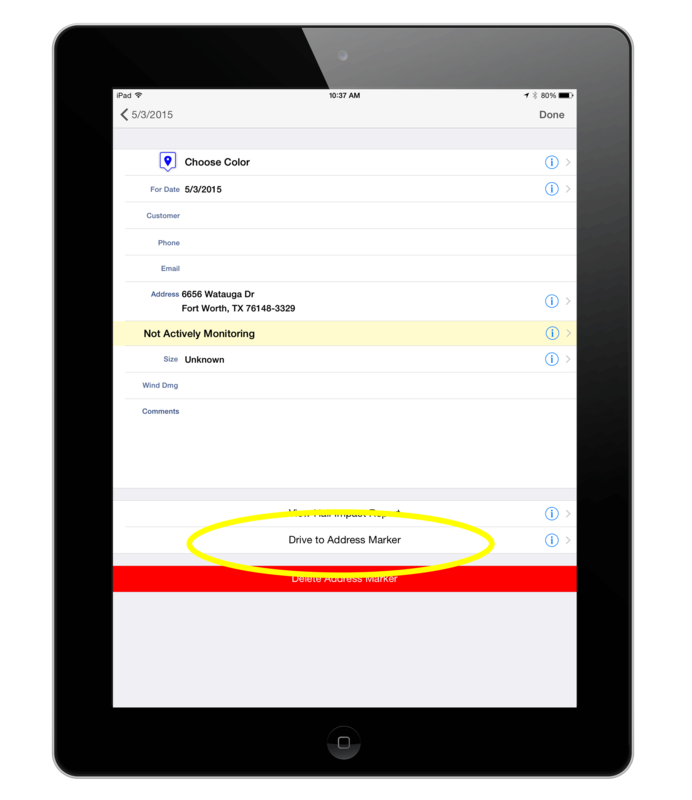 After the marker is on the hail map, tap on it and select “Drive to Address Marker”. That’s it! You now have turn-by-turn directions. 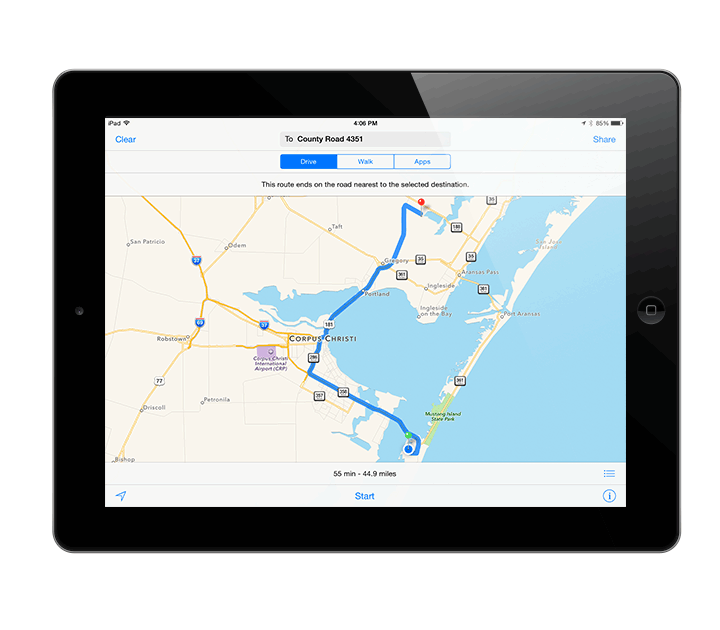 You can easily find your way back to previously marked areas and find promising new areas with your GPS. When you need a hail date all you need to do is zoom in on your screen to the area you want to search and tap the settings icon on the bottom right of the screen. Then tap “Find Hail in Current Map”. Now you are presented with a list of dates where hail was detected by radar in your screens viewing area. You can also get a hail date by creating an address specific Hail Impact Report from within Hail Recon®. Tap on any address marker and then tap “View Hail Impact Report” to generate it. The Hail Impact Report shows you the complete hail history of the address and can be branded with your company info and logo. Now you can send your branded Hail Impact Report to adjusters or homeowners. The Hail Impact reports are unlimited and included with your subscription. 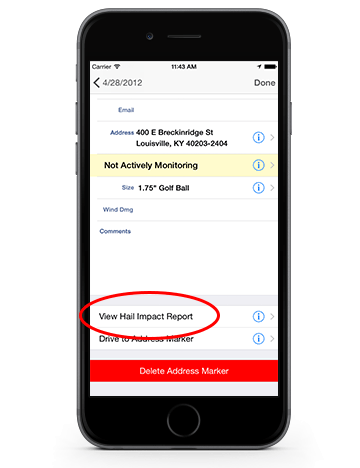 Tap “View Hail Impact Report” to generate an address specific report.